So I had some construction done on the house and they needed to build a temporary wall. I paid for all the lumber so when they tore it down I thought, why not? 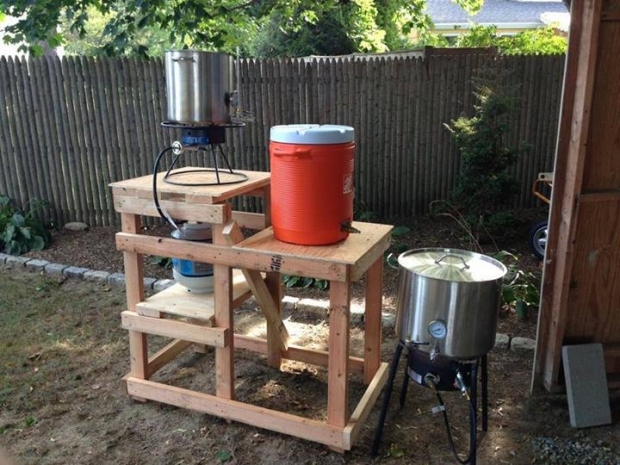 Lets build a brewstand! Anyone have any suggestions for wheels for this thing? The legs are 2x4s and the caster wheels I see on Home Depot have a plate no smaller than 2" which probably won't secure well. Any other ideas? Wheels with locks would be ideal. Re: Wheels for new brewstand?! You could try attaching the casters with u-bolts. It looks like you'll be moving across yard so maybe lawn mower or wheel barrel wheels with threaded rod for axel and what ever mounting bracket that will work. My vote would be for soft, inflatable, (3" wide) hand truck wheels on one end, then locking dolly wheels on the other which you could build up with plywood to level the whole thing up.